Automatic cutting of all type of bread in a small place. The advance and setback of the pusher is automatic (without pusher level) Regulable speed by a frequency variator, according with the type of bread. 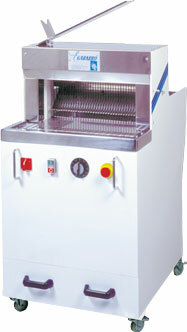 The bread slicer TPC + EBS machine it is made in three different versions of 43, 53 and 60 cm. According to the slicer’s zone width, which permit slice up breads which their maximum length is 40, 50 and 60 cm. Machine of great quality, designed and built with the highest technology.